Calvin Graham was the youngest of seven children of a poor Texas farm family and because of his abusive stepfather, he and one of his older brothers decided to move out. Calvin supported himself by selling newspapers and delivering telegrams on weekends and after school. He was just eleven when he first thought of lying about his age to join the Navy. The world was in the midst of the second world war and some of his cousins had recently died in battles. Graham made his decision. The question was how to do it. He started by shaving, as he thought it would ultimately make him look older. (And, note: Contrary to popular belief, shaving has no effect on hair growth rates or thickness) More effectively, he had his friends forge his mother’s signature for consent, stole a notaries’ stamp, and told his mom he was going to visit relatives for a while. On August 15, 1942, Calvin Graham was sworn into the Navy. He was twelve years, four months and twelve days old, the youngest individual to enlist in the U.S. military since the Civil War and the youngest member of the U.S. military during WWII. 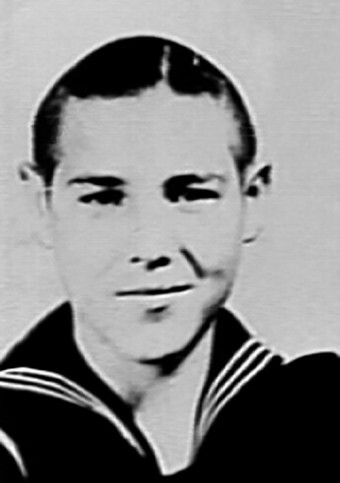 After spending time in San Diego for basic training, he sailed aboard the USS South Dakota as a loader for a 40 mm anti-aircraft gun, a “green boy” from Texas who would soon become not only the youngest to serve, but the nation’s youngest decorated war hero. The South Dakota, known also as “Battleship X” during the war, was a destroyer under the command of Captain Thomas Leigh Gatch that was heading to Guadalcanal, one of the Solomon Islands in the South Pacific. On the night of November 14, 1942, during the Battle of Guadalcanal, the battleship was hit forty-seven times by Japanese fire. One explosion threw Calvin down three decks of stairs. He was seriously wounded by shrapnel that tore through his face and knocked out his front teeth. Additionally, he suffered severe burns, but in spite of his injuries he tried to rescue fellow sailors from danger. I took belts off the dead and made tourniquets for the living and gave them cigarettes and encouraged them all night. It was a long night. It aged me… I didn’t do any complaining because half the ship was dead. For his efforts during the battle and aiding other soldiers, despite his own injuries, he received the Bronze Star as well as a Purple Heart. However, the distinction did not last long. A year after serving in the Battle of Guadalcanal, while his battleship was being repaired, Graham’s mother learned of what her son had been up to and informed the Navy of his real age. Rather than simply releasing him from his service, Graham was thrown in the brig for almost three months. It would seem the plan was to keep him there until his service time was up, but he was ultimately released when his sister threatened to go to the media and tell them about her brother’s imprisonment, despite his distinguished service. Graham was released, his medals stripped from him, and then dishonorably discharged, which is significant as it made it so he couldn’t receive any disability benefits, despite his injuries. At only thirteen, Calvin Graham was a “baby vet” who quickly found he didn’t fit in at school anymore. Once again he chose a life of an adult, getting married and fathering a child at fourteen, while working as a welder in a Houston shipyard. At seventeen, he got divorced and enlisted in the Marines. Three years later, he broke his back when he fell from a pier. This unfortunate event ended his service career and left him selling magazine subscriptions for a living. For the remainder of his life, Graham fought for both medical benefits and a clean service record. In 1978, he was finally given an honorable discharge (approved by President Jimmy Carter), and all his medals except the Purple Heart were reinstated. He was also awarded $337 in back pay but was denied health benefits except for disability status for one of his two teeth he lost during WWII. In 1988, his story came to public attention through the TV movie, Too Young the Hero. The publication of his story pushed the government to review his case and President Ronald Reagan signed legislation that granted Graham full disability benefits, increased his back pay to $4917 and allowed him $18,000 for past medical bills incurred due to injuries sustained while a member of the military. However, this was contingent on receipts for the medical services. Unfortunately, some of the doctors who treated him had already died and many medical bills were lost, so he only received $2,100 to cover his former medical expenses. Calvin Graham died of heart failure in November of 1992, at his home in Fort Worth, Texas. At the time of his death, all of his decorations were reinstated with the exception of the Purple Heart. Two years later, his Purple Heart was reinstated and presented to his widow at a special ceremony. He also received the National Defense Service Medal, Asiatic-Pacific Campaign Medal with bronze Battle Star device and the WWII Victory Medal. So, was it a battleship or a destroyer? It was a battleship and your article needs to be corrected. Battleships were named after states…..so what do you think.